Figure 1: Prokaryotic (A, B), eukaryotic (D-F) and phylogenetically indeterminate (C, G-I) microfossils from the early Mesoproterozoic Greyson Formation, lower Belt Supergroup. 50 μm scale bar applies to all specimens except E. Credit: Zach Adam and Nicholas Butterfield. The rise of eukaryotic organisms (organisms with complex cells, or a single cell with a complex structure) is still a mystery, but Zachary Adam (Harvard University) and colleagues have compelling evidence that Tappania plana may represent one of the earliest eukaryotic fossils. 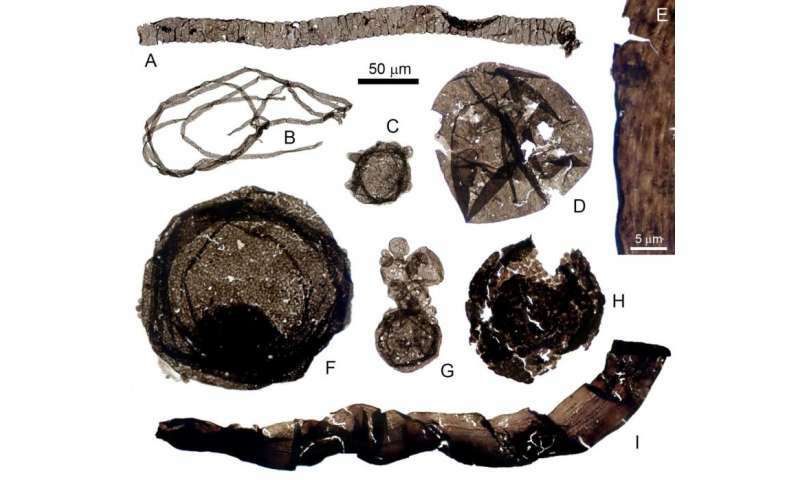 Well-preserved Tappania plana fossils from his Montana field site could be a crown-group eukaryote, providing one of the first links from this period in the fossil record to extant eukaryotes. There are limited rock formations that correspond to the age of the first eukaryotes. The Belt Supergroup provides a peek into this part of geologic history. Adam's field site is the Greyson Formation in the lower Belt Supergroup, located in western Montana. Previously, rocks sampled here have shown little fossil evidence for early eukaryotes, but Adam used a new recovery method that allowed more delicate fossils to be recovered. "You [can] get more interesting fossils if you dissolve the host rocks more gently," says Adam. He proposes that conventional recovery techniques may have destroyed fossils before the researchers were able to examine the remains, "there was some suspicion that the way the rocks were being processed to look for fossils was destroying the more interesting and delicate ones." Adam spent many years studying rocks collected from his field site in Montana and, with the guidance of co-author Nicholas Butterfield, was able to find multiple examples of early eukaryotic fossils in the Greyson Formation. Tappania plana was first described almost 20 years ago in shale samples from China. This organism acts as a shape-shifter with the ability to grow bulbs and tube-like structures. "If you can create a little ball and a little tube you can think of all the different permutations to change the shape and within that basic capacity you could reshape yourself into almost anything," says Adam. However, the samples from Adam's site are unique. They display an ability to grow a second membrane. This outer membrane can grow differently than the inner membrane and may function in resource allocation. "This means there was communication across the wall, directing resources," he says. Further, "this developmental capacity points to it being a crown group eukaryote, [as] evidenced by the expression of these morphological attributes." Adam says a driving question of his research is to fill in an evolutionary gap found between the simplest bacterium or archaeon to the simplest eukaryote, "Are they [Tappania plana] crown group eukaryotes—meaning they have all the attributes of the eukaryotes we see today, or are they somewhere in between? We don't have any examples of an intermediate between [these organisms]." There are still many questions about these fossils and Adam plans to continue his research on the origin of eukaryotes in the future. His fossil search techniques may even be used to aid future Mars missions. Complex life a billion years earlier than thought?